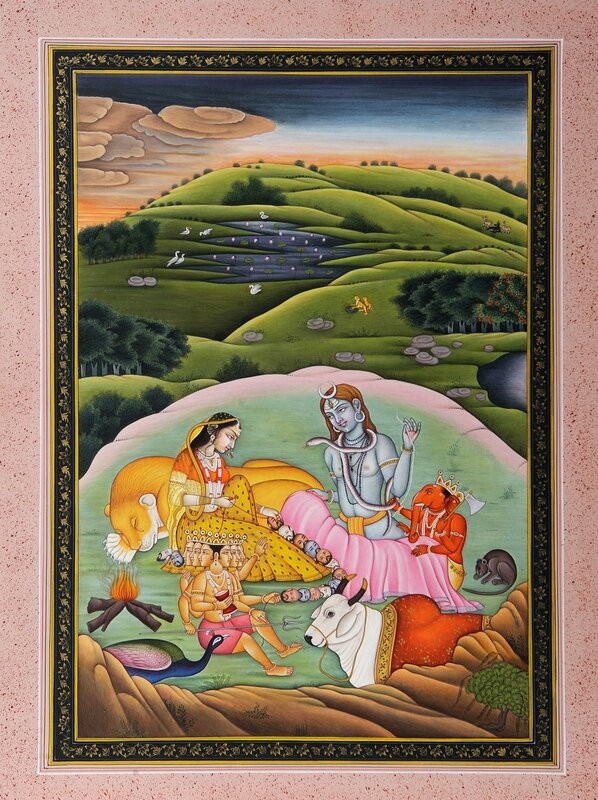 This miniature, rendered using the Kangra art idiom, the most evolved art-style of Himalayan hills, portrays Shiva family doing household things  stitching a 'sari', and threading skulls into a garland. This highly symbolic rendition perceives Shiva family not only as Shiva, his consort Parvati and their two sons  Karttikeya and Ganesh, or their vehicle, bull, lion, peacock and mouse, but also as including birds, animals and the entire nature. The artist has laid greater emphasis on portraying the conventional Shiva family father, mother, children and their pets. Cubs, deer, stags, cranes, ducks, trees, hills, lakes, the earth and the sky are drawn only as background but quite significantly they reveal the same mood of quiescence and contentment and the same divinity as does the Shiva family. Obviously, the artist has conceived the entire ambience as Shiva's own magnification and hence a single unit  a family. In this widened vision of the holy family, the artist seems to adhere to the views of ancient Indian thinkers who perceived the entire cosmos as the manifest form of Shiva. The painting is reminiscent of a late eighteenth century Kangra miniature depicting, though with minor deviations, this very theme and style. This Kangra miniature is with the Rietzberg Museum, Zurich. In this painting, Shiva's bull is unsaddled and Karttikeya does not have his father's drum and trident, as he has in this miniature. The number of firewood and the size of flames in the hearth have also been enhanced. Shiva has been represented as a 'yogi'. Except a narrow strip of loincloth, such as wear 'yogis', he has no cloth on his person. In contrast, Parvati has been costumed and bejewelled like a princess. Besides a 'lehenga' long skirt, woven with gold thread, a rich finely woven 'odhani' upper garment and a silk blouse, she has lavish jewels  pearls, rubies, emeralds, diamonds, all set in gold. The world mother has unparalleled aesthetic beauty. Karttikeya and Ganesh, though only in loincloth, have richly inlaid crowns and precious jewels on their persons. Of the pets, only Shiva's bull  Nandi, is saddled and quite richly too. Besides a variegated and widely diversified landscape in background, comprising far-reaching range of hills, distant sky, golden clouds, groves of trees, lakes with lotuses and populated by aquatic birds, various animals and typical terrain, the painting has multi-dimensionality and effects of light and shade, not usually seen in Indian miniatures. It is, however, most outstanding in its realistic thrust and fictional dimensions, or rather in combining these two traditionally conflicting elements in one frame. Shiva and his family are part of myths. He is the theme of dozens of Puranas and the object of worship for ages now. But, the artist does not discover him as a mythical being, or as performing an act prescribed in texts. He has woven around him rather the realism of actual life  something that he found a rural father doing, with or without the assistance of others in the family. This 'real' planted onto a mythical form, is a glaring fiction, as what it represents of Shiva is not his reality, but nonetheless it is a reality and Indian rural parents everyday live it. The painting otherwise represents a simple family business. Shiva is stitching a garment, more like a 'sari' of Parvati. Lest his needle hurt his snake, Ganesh is holding it away. Parvati, in return, is threading for Shiva the garland of human skulls. Lest the skulls slipped, Karttikeya is holding the other end of the thread. The skulls have been modeled as multi-coloured masks and not as dreadful skulls. Mouse and lion are asleep, whereas peacock and bull are wide-awake.